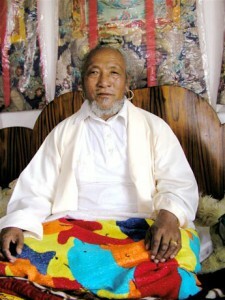 Kunzang Dorje Rinpoche was a major Chö and tsa-lung master and practitioner, and a senior student of Dudjom Rinpoche. He was born on a dakini day in 1930 in the Dampa region of northern Tibet, into a family lineage of Ngakpas. Shortly after his birth, he was recognized as the reincarnation of Charong Drubchen, by Dzigar Potrul Rinpoche. As a young child, he had many visions and interactions with the Dharmapalas. Dudjom Rinpoche requested Kunzang Dorje Rinpoche to lead several Tsalung and Tummo retreats, and to write commentary teachings on the Tummo and trulkor practices. These important commentaries have since been incorporated into the collected works of Dudjom Tersar and Rigdzin Sogdrub lineages. Kunzang Dorje Rinpoche has also been instrumental in preserving the sacred practices of the Rigdzin Sokdrup, the specialized yogic practices within the Northern Treasures lineage, which were discovered in Sikkim by Lhatsün Namkha Jikmé. In order to strengthen the lineage of the Rigdzin Sokdrup in Sikkim, Dudjom Rinpoche, along with the Sikkimese prince, requested Chatral Sangye Dorje and Kunzang Dorje Rinpoche to establish a three-year retreat center there, and to lead a select group of practitioners in long-term retreat. “In this way, without discriminating, I received the maturing empowerments, the liberating instructions and the reinforcing transmissions at the feet of many great masters together. I was filled to overflowing with their inconceivable kindness and put their methods into practice as follows: the common outer and inner preliminaries; the development stage of Mahayoga; the activities of approach and accomplishment (kyerim and dzogrim) of the Three Roots (Lama, Yidam and Khandro); the five supplementary yoga cycles of the Anuyoga Dzogrim, which functions through the tsalung and tikle ; the Khordé Rushen Dzogchen Atiyoga cycle of practice; the primordial Trekchö; the spontaneously formed Tögal and Osal practices from the Three Series of Dzogchen. This page was last edited on 18 July 2014, at 15:48.